Bajo la realidad de nuestro entorno, donde gran parte del paisaje ciudad lo conforman obras en construcción, es interesante dar un vistazo a la ultima instalación de la artista Rachel Whiteread. Actualmente en exposición en el museo Tate Modern, consiste en la organización de 14.000 cubos blancos apilados de diversas maneras. Los cubos en primera instancia fueron moldes de yeso sacados del interior de cajas de cartón. La idea era crear vestigios de espacio interior, moldes positivos de espacios negativos. Para mantener la condición de contenedores la artista reprodujo los moldes de yeso en polietileno traslucido para dar un mayor sentido de interior. Lo interesante esta obra radica en su propuesta de anti-monumento, convirtiendo una forma colapsada en paisaje. La disgregación de las piezas asemeja a una obra durante su proceso de instalación. A esto podemos agregar la analogía a la huella de intervención humana, al disponer las cajas tanto en pilas ordenadas como en aparente caos. Pues todas esas características, comienzan a asemejar esta instalación a lo que vemos en la ciudad hoy día, una analogía a la ocupación espacial y la presencia de las masas de interiores en esta. Además de traer a conciencia una situación intermedia entre proyecto y obra terminada, condición tensa que sin duda conforma nuestro entorno, paisaje y por que no, lugar en la ciudad. 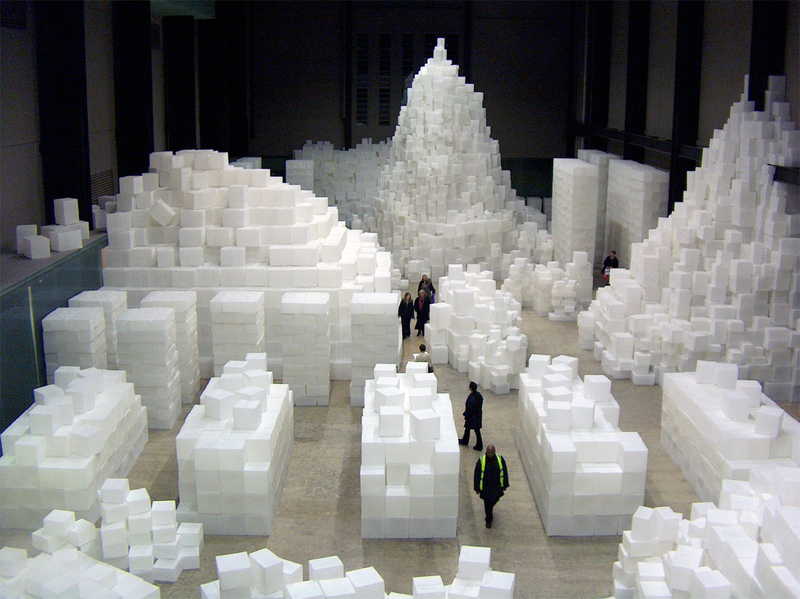 In a sense, Rachel Whiteread’s sculpture EMBANKMENT began with an old, worn cardboard box. She found it in her mother’s house shortly after she died. Whiteread was going through her mother’s belongings when she came upon a box she remembered well. It had had many lives: it used to reside in her toy cupboard next to piles of board games, and at one point was filled with Christmas decorations. Over time its sides started to collapse, the printed logo on the outside faded, and the lid came to shine with the traces of all the Sellotape used to bind it up over the years. Old containers of different kinds have often been the inspiration for Whiteread’s art. In 1993, she created a life-size cast of the interior of a condemned terraced house in London’s East End, a work that led to her winning the Turner Prize. In 2000, she completed the Holocaust Memorial in Vienna’s Judenplatz, featuring the cast of an entire library, with all the details of shelves and imprints of books. And in 2001, she crowned the empty plinth in Trafalgar Square with a translucent inversion of the plinth form itself. Each time, Whiteread has been drawn to spaces marked by signs of human life, be they ideas, monuments or bodies. Although the inspiration for EMBANKMENT came from the single box she found in her mother’s house, Whiteread selected a number of differently-shaped old boxes to construct the installation for the Turbine Hall. She filled them with plaster, peeled away the exteriors and was left with perfect casts, each recording and preserving all the bumps and indentations on the inside. They are ghosts of interior spaces or, if you like, positive impressions of negative spaces. Yet Whiteread wanted to retain their quality as containers, so she had them re-fabricated in a translucent polyethylene which reveals a sense of an interior. And rather than make precious objects of them, she constructed thousands. Around the time Whiteread began to work on this project she was preoccupied by the final scene of Steven Spielberg’s Raiders of the Lost Ark (1981), in which the fabled Ark of the Covenant is stored away. After being gently lowered into a crate and the top nailed down, it is wheeled off on a trolley. As the camera pans away we see that when it takes its place it will be just one in a gargantuan warehouse full of crates filled with heaven knows what. Whiteread has spoken of wanting to make the Turbine Hall into a kind of warehouse, and this is an intriguing response to a space which was once industrial but is now a museum. For what is a museum, after all, but a storage depot for art? Like much of Whiteread’s work, EMBANKMENT also makes reference to the legacy of American Minimalism. Artists like Donald Judd were drawn to the look of pristine, industrially fabricated cubes, and they used them to explore issues of repetition, the impersonality of mass production, and the relationship of the viewer’s body to the space occupied by objects. However, the cubes that make up Whiteread’s EMBANKMENT depart radically from these themes. Rather than impersonality, they maintain the imprints of human use; they are stacked up in both ordered and disordered piles; and whilst they encourage us to think about the space they inhabit, en masse they are also a spectacle, an unforgettable image that reveals itself slowly as the viewer approaches. At one stage, Whiteread had considered making a single vast monumental sculpture for the Turbine Hall. Ironically, what she finally came up with is an anti-monument, a form collapsed back into a landscape. The title refers not only to its riverside location, close to the Thames Embankment, but to the nature of its construction with the piles of individual boxes forming a series of barriers. In der riesigen Turbinenhalle der Tate Modern lief gerade die Ausstellung EMBANKMENT von Rachel Whiteread. Ganz viele weiße Kisten in mehreren Haufen; mal streng gestapelt und ordentlich, mal chaotisch, mal ganz hoch, mal nur zwei, drei Lagen. Insgesamt wohl so um die 14.000 Plastikkisten. Rachel Whiteread is one of Britain’s leading contemporary sculptors. Born in London in 1963, she studied painting at Brighton Polytechnic from 1982–85 and sculpture at the Slade School of Fine Art from 1985–87. She shot to public attention in 1993 with her sculpture, “House,” a life-sized replica of the interior of a condemned terraced house in London’s East End which provoked intense public debate until it was eventually demolished in 1994. She won the Turner Prize in 1993. Over the last decade she has developed a significant international reputation, creating major public works in both Europe and the United States. Her winning proposal for the Holocaust memorial at the Judenplatz in Vienna was one of the most prestigious sculptural commissions in Europe in the 1990s. This piece involved placing the cast interior of a library, including imprints from the books on their shelves, into the centre of the square. It was unveiled in October 2000. She represented the UK at the 1997 Venice Biennale and created “Monument” for the empty plinth in Trafalgar Square in 2001. Her “Water Tower” (1998) was just reinstalled on the roof of the Museum of Modern Art, New York this autumn. Other noteworthy solo and group exhibitions include “Rachel Whiteread,” Serpentine Gallery, London (2001, traveled to Scottish National Gallery of Modern Art, Edinburgh); “Transient Spaces,” Deutsche Guggenheim, Berlin (2001, traveled to the Solomon R. Guggenheim Museum, New York through 2002); Kunsthaus Bregenz, Austria (2005); MADRE, Naples (2007); Museum of Fine Arts, Boston (2009); and “Rachel Whiteread: Drawings,” Hammer Museum, Los Angeles (2010, traveled to Nasher Sculpture Center, Dallas and Tate Britain). Aside from the already mentioned House (1993), Water Tower (New York, 1998), Monument (London, 2001), another notable public commission is Embankment at Tate Modern Turbine Hall (2005). Rachel Whiteread (right, pictured by Nicholas Turpin inside ‘House’ before it was sealed) was born in London in 1963 and studied at Brighton and the Slade. Rachel Whiteread nació en Londres en 1963. Estudió pintura en la Brighton Politécnica 1982-85 y escultura en la Slade School of Fine Art 1985-87. Ganó el Premio Turner en 1993. Su obra ha sido expuesta internacionalmente en numerosas exposiciones individuales y colectivas, entre ellas el pabellón británico en la 47º Bienal de Venecia (1997); Rachel Whiteread, Serpentine Gallery en Londres (2001, viajó a la Galería Nacional Escocesa de Arte Moderno, Edimburgo); Espacios transitorios, Deutsche Guggenheim, Berlín (2001, viajaron a la Solomon R. Guggenheim Museum, Nueva York, hasta el año 2002); Kunsthaus Bregenz, Austria (2005); MADRE, Nápoles (2007); el CAC Málaga, España (2007); el Museo de Bellas Artes de Boston (2009), y Rachel Whiteread: Dibujos, Hammer Museum, Los Angeles (2010, viajaron a Nasher Sculpture Center, Dallas y Tate Britain, Londres). Whiteread vive y trabaja en Londres. Rachel Whiteread (1963-) Nasceu em Londres. Estudou pintura na Faculty of Arts and Architecrure, Brighton e escultura na Slade School of Art. Fez parte da Young British Artist e foi a primeira mulher a receber o Turner Prize. Participou da Bienal de Veneza. Recebeu o prêmio para instalação de trabalho no 4o pilar de Trafalgar Square. Trabalha com moldagen de objetos de pequenas e grandes escalas usando grande variedade de materiais tais como gesso, cimento, borracha, resina, bronze e feltro. Ela registra vestígios da passagem do homem em ambientes domésticos e de comunidades. Desenhos, gravuras e instalações são seus meios de expressão. É representada pela Gagosian Gallery.